A man hires an ex-con to kill his sister’s abusive husband, but the desperate act sets into motion a shocking series of events in this intense indie drama. What I do isn’t about the people that die. It’s about the people that are left alive. They get the short end of the stick, as far as I’m concerned. 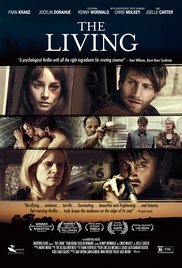 “The Living” is a basic revenge film in which the reprisal turns out quite differently than initially intended. A social drama about domestic violence and alcoholism, although I started wondering after a while how critical this alcohol problem was. The evolution to this violent abuse wasn’t discussed. How could it come to this? Were there already signs of an oncoming problem? And were there cases of domestic violence already in the past? You’re kept in the dark when it comes to these relevant considerations. The first image, accompanied by music from The de Luca Brothers, is that of some empty beer bottles scattered around on the ground and an unconscious Teddy (Fran Kranz), who apparently is sleeping it off. Upon awakening he finds out he has a bloody hand and his wedding ring is missing, after which he becomes aware something terrible happened the previous night. The fact that his young wife Molly (Jocelin Donahue) is no longer present in the house, confirms his suspicion. Molly has fled to her parents’ home where her mother Angela (Joelle Carter) and brother Gordon (Kenny Wormald) still live. When Teddy arrives there and Molly returns with him despite everything that happened, Angela threatens to use her shotgun and shoot Teddy. Simultaneously she’s also furious about Gordon defending his sister in a lax way. Pissed off about what happened to his sister, Gordon takes the advice of a workmate (who knows someone who also knows someone else who could teach a person a lesson), and he goes looking for this person to solve the problem once and for all. Unfortunately this is, despite some brilliant performances, a fairly banal story with a predictable storyline and no surprising conclusion. The whole film actually just shows the emotional relationship between a few people. First, the fragile and broken relationship between Molly and Teddy. Molly makes it clear to Teddy that he has to do everything to make up for the incurred suffering. What bothered me in this part of the story, was twofold. Teddy doesn’t really resemble a typical alcoholic who tends to use violence against his wife. He looks remarkably fresh after an evening of heavy drinking (with a solid blackout as a result) and seemingly he doesn’t have problems with staying away from booze. And Molly didn’t need much time to forgive him again. Teddy didn’t have to pay enormously for his actions. But I’m convinced this is most common in this kind of situations. The second relationship arising in this film is that between the timid, uncertain Gordon and Howard (Chris Mulkey), the psychopathic killer who isn’t afraid of murdering someone for a few dollars. This subtle interplay between these two opposites was the most fascinating of the whole movie. Magisterial acted by both. The realization that slowly grows to Gordon that he may have took the wrong decision. Howard is someone who is straightforward and clearly takes matters in hand to finalize it. There’s a key moment in a restaurant where I thought the film was going to escalate into a spiral of violence. But to my surprise it remained to that single moment and the impact was limited to the fact that Gordon was more uncertain and scared to dead of Howard. Mulkey is brilliant as the crazy killer. Top performance. But as I mentioned earlier, these superb performances can’t cover up that the essential substance of this film is kind of feeble. A succession of obvious events and a simple story with no undue risks taken. Domestic violence is usually a complex psychological story. In “The Living” this is elaborated rather simplistic. Even the injuries Molly had after the quarrel, didn’t exactly look realistic (it was more a result of a makeup party that got out of hand). Thanks to the charismatic Mulkey, this film was worth to watch.